A note was posted on Dead Air Space today hinting to a possible webcast coming soon. Our guess is that it will be tonight’s show in Santa Barbara. Now wouldn’t that be amazing? UPDATE: Yup, it’s official. Webcast tonight! Hello! To celebrate the end of a brilliant tour, we’re going to webcast the last show here in America. We’ll be playing live in Santa Barbara, at the Bowl. It’s one of our favourite places to play; I think we’ve ended tours there before, once even playing a cover of ‘ cinnamon girl ‘. It’s not too big, in fact it’s very intimate, a small arena with a dirt floor, set in pretty countryside. It should be a special night, for lots of reasons, and we’re going to try and share as much of it as we can on the webcast. Nigel, our producer, will be helping out getting it to you, so if it goes wrong….It’s live! Thank you so much to everyone who’s come and seen us this year; it has truly been the most special and exciting tour for all of us. Radiohead webcast on New Year’s Eve! Radiohead will be doing a webcast on New Year’s Eve and Day to celebrate the physical release of In Rainbows. The webcast will air on radiohead.tv at 12 midnight GMT as well as on Current TV in the United States. Please see Current’s press release below for times. A special performance by Radiohead will be aired exclusively in the USA by Current TV on New Year’s Eve and New Year’s Day. The band will be performing all of the tracks from its newest album, In Rainbows, for a taped, private, hour-long performance, which will run commercial-free on Current TV and on www.current.com simultaneously. “We are pleased to partner with Current for its innovative spirit” said Phil Costello, head of TBD Records, Radiohead’s US record label. Through Current’s broadcast network, Radiohead’s concert will be available to 41 million households across the United States and to viewers of Current.com. After its initial on-air and online broadcast, the performance will be archived on www.current.com for additional viewing. This news follows Radiohead’s self-release of its seventh album, In Rainbows, which was made available directly from the band’s website on October 10, 2007 solely as a DRM-free digital download, allowing fans to decide what price they would pay for the album. The physical release of the CD and LP will be in stores January 1, 2008. #1 album of the year NEW YORK! #1 album of the year MOJO! #1 album of the year FILTER! Top 10 album of the year in ROLLING STONE, HARP and many more. LEAD 4/5 review in SPIN OUT NOW! What an evening (or afternoon if you’re like me still at work)! 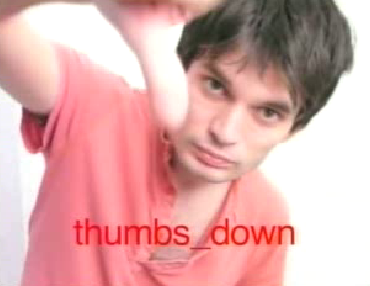 Radiohead just finished up their webcast, entitled “Thumbs Down”, just a while ago. Everything went pretty smooth until the very end when the sound went out right before the band went on to perform their final song. Mel over at w.a.s.t.e. says that they are hopefully going to put it up so we can view again and this time hear it. The band went to play a final song but the sound cut out. Unfortunately, we do not know what song it was. Other highlights of the evening include a clip of the movie Se7en where Thom’s head is in the box (replacing Gwenyth Paltrow’s) singing “15 Step”, Ed reciting “The Burial of Sir John Moore After Corunna” by Charles Wolfe, Adam informing us that Thom is “rebranding” his image so that people don’t think he’s so “miserable”, and Stanley drawing on the chalkboard. We hope to have video up to show you soon. It sounds as if the band will be posting it up on their site as well so those of you that missed it can see. 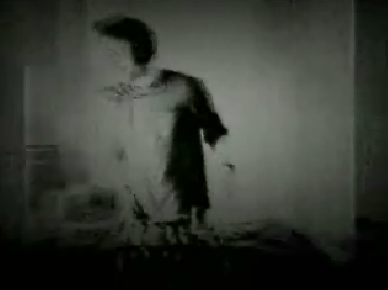 Head over to www.radiohead.tv and enjoy. It’s hard to believe that it was 8 years ago when Radiohead did their first webcast, named “Amateur Night”. Ahhh, the memories. UPDATE: Okay, apparently 9 pm is not the correct time. Either that or there are technical difficulties. Stay tuned and hopefully this party will start up soon cause why else would you be staying in front of your computer on a Friday night? New post up at DAS today from Stanley about another test webcast. Amazing how just a “test” can get us excited.